It’s been a second since we have heard any news from up north on films heading our way but that changed late last month. The folks over at Zell-Koj Studios is set to premiere their homage slasher DARK FOREST to the masses on August 14th. The film is directed by a collective of filmmakers David Zellis, Roger Boyer, Craig Guiboche, and Shelly Anthis. 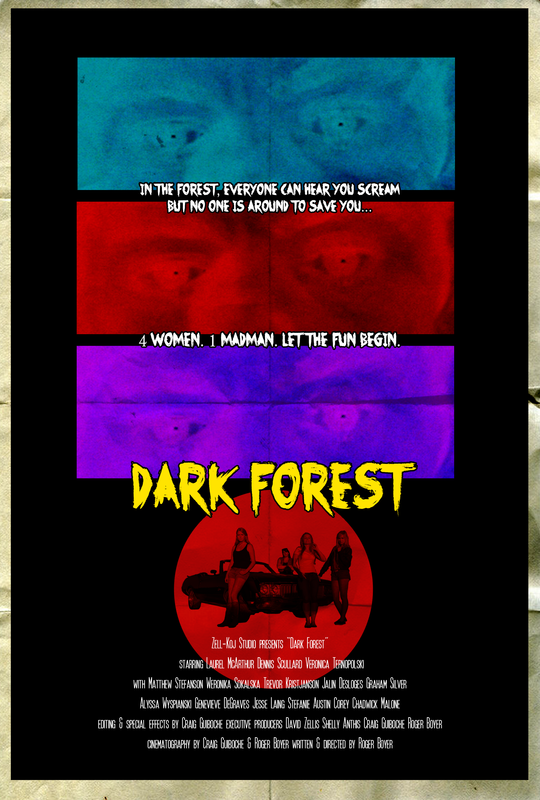 DARK FOREST will be hosted at the TOWNE 8 CINEMA and the entire cast and crew are local to the Winnipeg area. Read on for the details and hopefully we can get our hands on a review screener to tell you all the goods soon. Dark Forest was shot in and around the Winnipeg area, and has an all local Cast & Crew. Zell-Koj Studio are making leaps and bounds, self distributing the film; with a DVD and Blu-Ray release already in the works. Seldom do independent film companies in Manitoba go straight to the multiplex theatres, but Zell-Koj is confident in the audience of horror buffs that it hopes to attract this August. Zell-Koj Studio is a production company based in Winnipeg, Manitoba. Zell-Koj is a business comprised of local filmmakers: David Zellis, Roger Boyer, Craig Guiboche, and Shelly Anthis. Dark Forest is their debut feature film.